Normally, I don’t post about CE often especially about a $200 CE, but I think the statue is freaking amazing. For our faithful fans and new ones alike, we are pleased to unveil the Mirror’s Edge Catalyst Collector’s Edition. The Collector’s Edition was made to help foster player’s affinity with our heroine, Faith, as she grows up and makes a stand against oppression, represented by a beautiful adult and young Faith real life diorama that stands 14 inches tall. Players can also join Faith’s fight as part of the runner’s group in the city of Glass with temporary tattoos, or go behind-the-scenes to see more about the game’s creation through concept art and an exclusive lithograph. 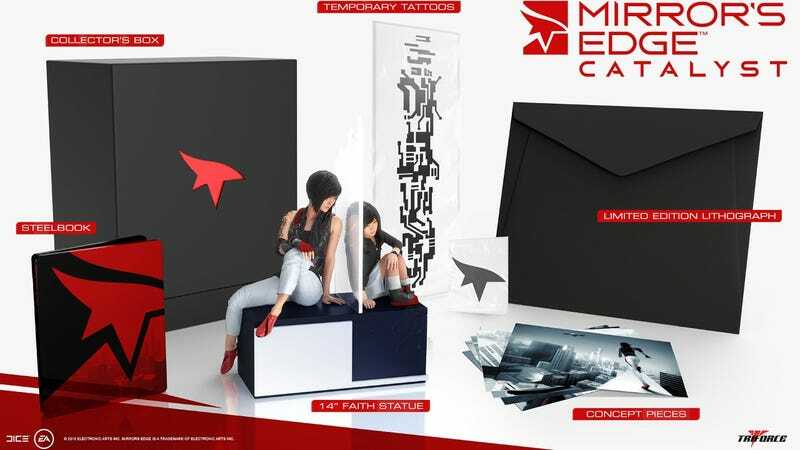 Available in limited quantity for SRP $199.99 worldwide in select retailers, the Mirror’s Edge Collector’s Edition is available for the PlayStation 4, Xbox One and the PC. Players can pre-order a copy starting today at GameStop stores in North America or online, with the other retailers worldwide to be announced soon.